Ptolemy X was King of Egypt from 110 BC to 109 BC and 107 BC till 88 BC. He was the son of Ptolemy VIII Physcon and Cleopatra III. 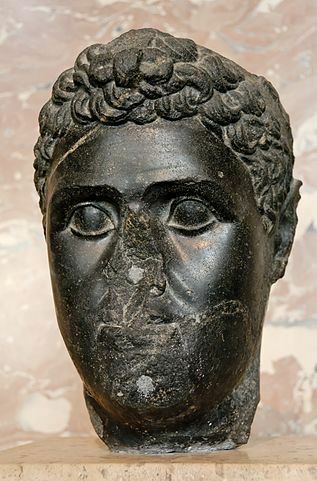 In 110 BC he became King with his mother as co-regent, after his mother had deposed his brother Ptolemy IX Lathyros. However, in 109 BC he was deposed by Ptolemy IX. In 107 BC he became King again, and again with his mother as co-regent. In 101 BC he had his mother killed, and ruled either alone or with his niece/wife, Berenice III. He was exiled around 88 BC when his citizens and army turned against him. He fled to Syria, and upon his return with a new army became infamous for melting down and looting the golden sarcophagus of Alexander the Great, in order to pay the mercenaries which brought him back on the throne, and replacing the former sarcophagus with one made of glass. The citizens of Alexandria were so outraged at this act, that he was subsequently exiled again almost immediately and that all records attributed to Ptolemy X would try to be erased. He would later be killed on his way to Cyprus.